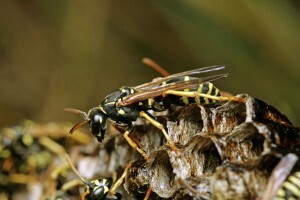 Wasps and Wasp Nests - East Lincs Pest Control eliminate them. Wasps are most active in the warm summer months. In the UK, the Common Wasp and German Wasp cause the most annoyance and painful stings. Only female wasps have a sting that they can use repeatedly, if they feel under threat. In most cases a wasp sting causes no long term harm, but it can be life threatening if you are allergic to stings. Treating a wasp nest is often the most efficient way to control a wasp problem. Wasps can build nests outdoors under eaves or, if they can gain access, they can find sheltered areas inside your home, such as wall cavities, roof spaces and attics. In some situations, it can be beneficial to leave wasps in a garden for natural pest control, so we may move a nest out of harms way, depending on the environment.